Infinite growth is impossible. Resources are limited and most of them are not renewable. The development of synthetic substitutes creates problems as well as solving them, and reflects the growth mentality that must be altered if mankind is to survive. Population growth, economic growth and use of resources must be restricted if society is to meet the needs of man. Now is the time to do it, and New Zealand can lead the world in developing a new society, the new set of attitudes necessary to form worthwhile satisfying communities. There is a maximum number of people which the earth can sustain at reasonable standards of living. Already a large proportion of the world's population is underfed, poorly clothed, and unable to reach its full mental, physical and social potential. The effectiveness of each and every individual, his happiness, and his ability to contribute to society will reduce as population numbers increase. Limiting population growth will enable present resources to be shared equitably around the world - without greatly reducing our present standard of living. Population growth must be reduced if "space-ship earth" is to continue voyaging through space. Education in family planning, contraception and human relationships is needed to achieves this. The economic machine is geared to meeting material needs yet it has failed to provide them for many people around the world, and for some in New Zealand. This same machine is also beginning to seriously threaten our natural environment. It is possible to develop an economic system based on co-operation, sharing and conservation, a system which meets our material needs and at the same time promotes the satisfaction of non-material needs such as friendship, play, self-expression, a sense of individual identity, social approval, self esteem, and peace of mind. Values' economic policies are aimed at producing a stable-state economy. Growth must be curbed, and existing wealth redistributed. A flourishing and vital rural community is essential to New Zealand's future. Our most important economic assets are land, climate and accumulated farming skills. Measures which promote effective. efficient and rational use of land are needed to enable agriculture to cater for the needs of New Zealand, and to help it meet its commitments to the rest of the world. Farm incomes must be guaranteed. Forestry must be encouraged - but not to the extent of destroying an important natural resource, native timber. Fishing has so far been greatly neglected by the government, and deserves further encouragement. Employees are too often not involved in decisions which affect their lives. This is a primary cause of industrial unrest, and workers must be given the right to be involved in management and control of industry. Restructuring of many industrial processes is necessary if people are to achieve job satisfaction. Unions have an important role to play in this area. Retraining schemes, the introduction of job-sharing and more flexible working hours will also greatly reduce industrial strife. There are pressures on people to keep producing and consuming more. Much advertising creates artificial wants and promotes dissatisfaction - even though New Zealand is a relatively affluent society and the material needs of most people are met. Once basic material requirements have been provided, human needs are distorted by continued emphasis on material consumption. If society were operating sensibly, the more goods we obtained, the fewer we would need. Advertising should be regarded as an information process, rather than a persuasion process. Packaging of goods should be kept to a minimum. Firms should be given incentives to make longer-lived products. Consumer education is needed, and smaller, more personalised shopping centres should be encouraged. Technology can do much to lighten the burden of work many people carry. It can make life easier and more comfortable, and give people more time to pursue leisure. But often, technology has made work meaningless, has replaced the tasks from which people derive satisfaction. Technology, instead of making human hands and brains redundant, should help them become more productive. The ethical, cultural and environmental implications of technological development should be assessed - and technology should be rejected where it does nothing to promote human involvement and awareness. There is nothing wrong with man altering his environment. But it must be done carefully, so the alterations do not cause the breakdown of the natural systems on which every living thing depends. Limits to population growth and the development of a stable-state economy are essential if pollution is to be prevented. Products must be recycled as much as possible. The urban environment must be kept on a human scale, because one of the prime causes of social problems is the alienation of people in the places where most of us live - the cities and towns. The demand for energy is increasing at an alarming rate. New Zealand is being forced to develop more and more expensive methods of producing electricity, and is misusing its primary energy sources. The development of nuclear power is unacceptable to the Values Party, and there is a limit to hydro-electric and other electric generation potential. Energy consumption must therefore be stabilised. Transport is one of the heaviest users of fuels, and so the economic use of public transport systems must be encouraged. The gap between rich and poor countries is widening, and will never close if the present system of international trade and economic organisation is allowed to continue. The internal policies of our government are based on eliminating poverty and inequality - surely our external policies should have the same set of values? A just world order and a stable world economy is essential if starving millions are to be fed, homeless people housed, and illiterates educated to reach their full potential. Three main kinds of assistance are needed for the underprivileged areas: relief aid, development projects, and help with political, economic and social change. Multinational corporations have too much control in too many foreign countries - including New Zealand. There is a great need for mankind to be united - to become one species on planet earth, rather than a multitude of fragmented and bickering "nations". The United Nations has a major role to play in any attempt to break down international differences. Just as it is essential for New Zealand to develop a stable society, a just, environmentally-sound world order must be developed if mankind is to survive. Control and use of the sea and the sea-bed is one area in which international co-operation could be readily achieved. The Antarctic is another. New Zealand must be independent and non-aligned if it is to give a lead in the new attitude to international relations. Individual freedom must be allowed unless it is clearly outweighed by the interests of the community as a whole. In the matter of abortion, people must have freedom to plan their own families. The Values Party supports free and readily available contraception and sterilisation, as well as freedom of individual conscience. Censorship inhibits the development of responsible adult citizenship, although some censorship may be necessary in the interests of children. There is a need for extensive safeguards to ensure the confidentiality of data collected-on the affairs of individuals. The State should have no role in regulating sexual practices between consenting adults in private. Present drug laws are inconsistent and often make the problem worse - but the Values Party does not advocate the use of drugs in any form. Greater controls are needed on the use of firearms. New Zealand practises a form of sexual apartheid. Children are taught concepts of masculinity and femininity which encourage boys to be adventurous, curious and rough, girls to be decorative, helpful and clean. There is no reason why both males and females should not share these qualities. Equality for women should not simply enable women to share a man's world on male terms. The status of the traditional female values which stress co-operation, nurturing, healing, cherishing and peace, should be raised, these are the values which are needed if everyone is to survive. Men and women should share work and home environments - there is no reason why both can't be breadwinners, and it is generally desirable for both to spend time bringing up children. The task ahead is not to assimilate the Maori but to help him foster his racial and cultural identity. There is much in Maori society, particularly the traditional attitudes to land - which could contribute to a stronger, healthier total society - if the pakeha could accept it. 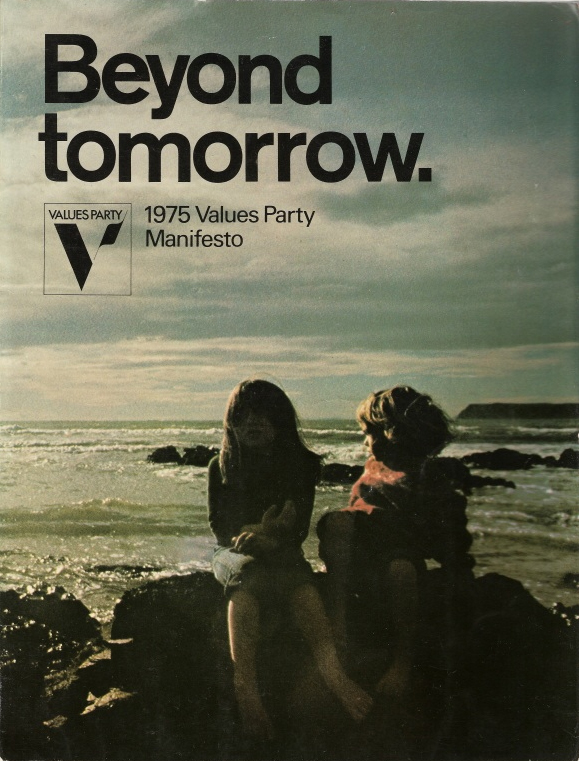 The Values Party would encourage the development of urban marae, train police recruits and employers in race relations, and support unions which promote courses for immigrant Polynesian workers. Prisons isolate inmates from the community, and deprive them not only of freedom but also of their self-respect and humanity. This makes it difficult for released prisoners to readjust to society and increases, rather than decreases, the possibility that they will offend again. If a law-breaker must be imprisoned, the only punishment inflicted by society should be the deprivation of freedom, for this is the most valued of human rights. Emphasis should be placed on rehabilitation and on training offenders to live within the accepted norms of society. Alternatives should be found to prisons, and prisons themselves made as congenial and normal as possible, to reduce unrest and aid rehabilitation. The community should be encouraged to interact with prisons and other penal institutions. Communities have become too big and families have become too small Because of the sprawling nature of cities and towns, and because of increased family and individual mobility, the formation of small areas with a community of interest is now rare. New Zealand badly needs a set of clearly defined national goals with which the whole community can identify. Government should be decentralised, and people given as much say as possible in running their own affairs - in determining the type of community in which they live. Extended families - of grandparents, parents, children, and perhaps friends and other relatives - should be encouraged. So should other forms of communal living. Children should be under the influence of more than one adult, and child-care centres should be more than mindless baby-minders. The education system can be used to maintain the present system or to help develop an alternative. At the moment, our education system is not equipping young people with the skills they need to cope with life in a changing world. There is little point in simply updating the system so it caters better for a society that is fundamentally competitive and materialistic. Education should be geared to the development of a just, co-operative, community-based society. A major effort is needed to tackle many of the problems of modern education - there is a need for improved adult education, for greater retraining, and to improve facilities for minority groups. The decision-making process of education must be reformed, to allow for greater power at community and regional levels. There should be greater diversity of educational styles, to allow for individual preferences and differences. Everyone has a right to health care, when and where it is needed. Need should be the only criterion for receiving care. The health service should be decentralised, so that communities can decide for themselves the type of service they want. But because resources are finite there is a limit to the amount of money that can be spent, so services must be spread as equitably as possible. Prevention is better than cure, and the development of a stable society would do much to prevent many of today's diseases - the diseases of stress and affluence. An objective of all Values' policies is to create a society that has no need for social welfare as it is traditionally understood. A guaranteed minimum income would replace most benefits and superannuation schemes. The caring, cohesive community established once growth rates had been stabilised, would cater for most people's needs. There will nevertheless be a continuing need for the traditional forms of welfare', and "common situation" groups such as Alcoholics Anonymous should be encouraged. Shelter is a basic need of mankind. People have a right to warm, dry, comfortable accommodation, at a reasonable price. Yet after many years of effort by successive governments many people live in poor quality housing at too high a price. It is very difficult to buy a house. Part of the problem is that speculators are taking advantage of people's need for housing. Part of it is that some dwellings are under-used. Building cannot keep pace with population growth. There should be tighter controls on speculation. More houses should be built, and money and other assistance made more readily available. Variety in housing, and alternatives in living styles, should be encouraged. Local bodies should be more concerned than they are with the wider needs of the community. Too often, important decisions affecting a local area are left to a distant bureaucracy. Decisions on matters such as housing, health, welfare and education should ail be decentralised. At the same time. there is a need for a reorganisation of local government - regional, district and community councils should be developed. Rates should be abolished in favour of a local income tax. Only a strong sense of community can counter the massness and alienation of modern western society. More power, more responsibility, and more autonomy must go to regional levels of government. Greater openness is needed in central government, and the public must be more involved in its processes. The present "confrontation" debating system should be reformed, and MPs given greater assistance in their work.